3 Totally Lit Smart Bulbs That Work With IFTTT | OhGizmo! By Aiza Coronado on 11/25/16 • Leave a comment! The easiest way for anybody to get started with building a smart home is through the lights. They’re the easiest to setup and some don’t even need a hub — just the bulbs, a decent Wi-Fi connection, and your smartphone. To take your lighting a little further, you can turn to IFTTT (If This, Then That) for no-sweat integration. You can set schedules, dim the lights automatically, and switch them on a couple of minutes before you get home. Here are 3 totally lit smart bulbs that have ready-to-use IFTTT recipes for you to use. We’re starting with the most popular bulbs, the Hue. The IFTTT recipes for Hue include turning the lights on/off at certain times, during sunsets or when you get home; switching the colors to blue when it rains outside; making the colors loop when you feel like it, and dimming down the lights. You can find practical recipes on IFTTT for WeMo like switching the bulbs on and off when you get home or when it’s raining outside or track the bulb’s energy usage in your Google Drive. But there are fun uses too! You can make the bulb dim a little bit when you get an email from your SO or get notified of your favorite football team’s score with your WeMo bulbs. LIFX probably has the most number of available IFTTT recipes online and they range from practical to smart-home interactive to the unnecessary, but charming. As expected, there are recipes that turn on the lights on/off when you arrive/leave, fade the lights so you wake up gently in the morning, and flash the lights when your doorbell rings. Then, there are fun recipes which make the bulbs blink when you’re mentioned on Twitter or Facebook. Or recipes that make the bulb flash your team’s colors everytime they score! 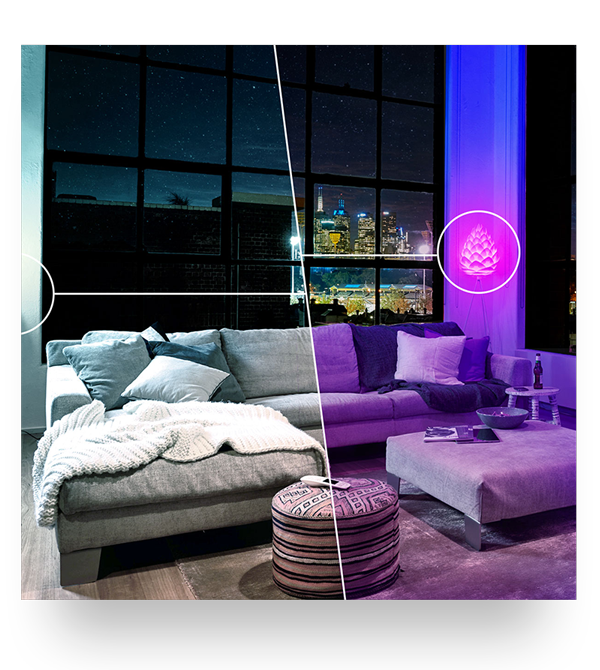 You can get any of these bulbs, but in case you want the bulbs with the most number of available IFTTT integrations (the LIFX bulbs), you can get one at a $15 discount with the code LIFX15. ← 4 Deal Black Friday Roundup!